Home » EAdirections Blog » FAQ – What is “True-EA”? FAQ – What is “True-EA”? True Enterprise Architecture (True-EA) is quite simply architecting the enterprise. The overwhelming majority of EA efforts that we have come in contact with over the last two decades have, in fact, been IT Enterprise Architecture (IT-EA) efforts. They have been led and operated by IT professionals working within the CIO/CTO’s organization, with a focus on IT outcomes within the domains of technology infrastructure, automated information systems, and data. True-EA manifests itself as the full context of the enterprise, planned in a holistic and comprehensive fashion, with separate ownership of the business (operations and information) domains and the IT (information technology infrastructure, application, and data) domains. A relationship, usually formalized with a jointly represented central committee exists between the two separate but compatible efforts. 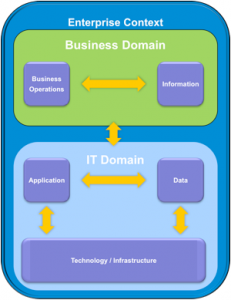 The union of the Business Architecture Domains with the IT Architecture Domains is True-EA. « Previous Post: FAQ – What EA Metrics should we collect and report?